The Barista Bar In Action! 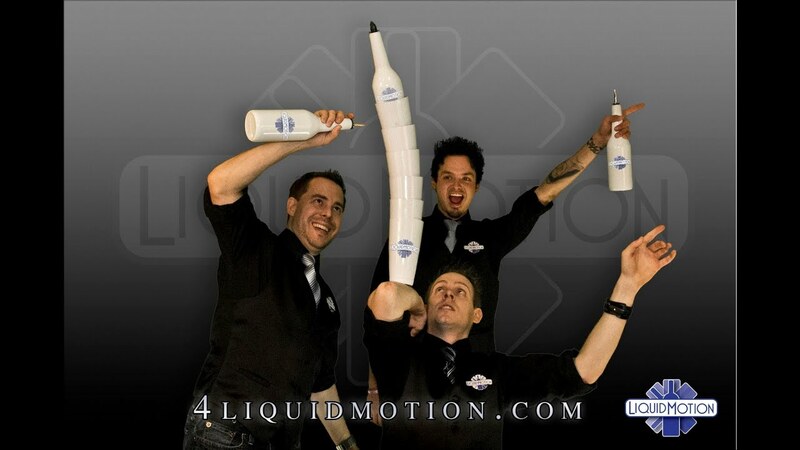 Liquidmotion not only sets the bar, but raises it with our Champion Flair Bartenders who flip, mix, and entertain your guests at corporate events, weddings, dances, and parties. Our bartenders are a great feature or accessory to any event and can “steal the show” or fade into the background. Liquidmotion can work with existing caterers, or function independently to provide premium beverage service coupled with exciting showmanship. Liquidmotion is great for non-alcoholic functions too, as we specialize in making “mocktails” with premium ingredients. Coinciding with our Trendy Barista Bar that works great for college events, after-proms, or any events that want the fun and not the alcohol. I hired Brian for my husband's birthday party to teach a small group of us to make manhattans. We hadn't had that much fun in a long time. Brian was very professional, but also incredibly personable and humorous. We started the night with some wine and apps, then he taught us how to make manhattans (and variations of the drink), and finished up with a very fun wine game. Brian was easy to work with. He had great ideas for the wine game, and even provided me with a complete shopping list. The night was unique and totally tailored to our small group. We'd love an excuse to hire him again! it went smoothly, well prepared, eager to help and make the party spectacular! Brian was great to work with during the planning process. He knew exactly what kind of liquor and mixers we should have, except our guest did more shots than mix drinks. That was a first for our bartenders, pouring more shots. Brian was also quick at reaponding back to emails and phone calls. John and Jesse were the bartenders for our reception and they did an amazing job. They showed up on time to set up and clean up around the bar area before they left. Our bar was packed the first few hours and everyone was happy. I would recommend Liquidmotion to everyone I know and would definitely keep them in mind for future events. Spectacular service for our outdoor wedding from start to finish. Everyone we worked with was courteous and attentive. Highly recommended! Brian & his team from Liquid Motion were a delight to work with & seemed genuinely happy to be there. One of our guests that's a veteran bartender even commented what a great job they did. Speedy service, opened the bar early when the rain delayed our wedding ceremony for an hour, & helped us figure out quantities for wine/booze/beer, too. I hired Liquid motion for a client event, to bring in some 'flair' into the agency. Not only was Brian such a pleasure to work with, he hit the event out of the ballpark. Clients were so impressed at how over the top we went with this event, and said Brian was a rock star. I am the corporate planner for my company - and we do events all over. I will definitely use Brian, and Liquid motion again. I like how quickly Brian responds also - makes planning and working out logistics to event a breeze. Which is a difficult side to planning. Thanks Liquidmotion!! Brian and Ann helped with all aspects of our wedding bartendings needs from helping make the shopping list, to having water at the ceremony, to set up, serving, and clean up. We did not have to worry about a thing the day of our wedding. Reasonably prices, friendly, competent people. Will be recommending liquid motion to others planning events. Thanks again! We have used Liquidmotion for two different events and they were phenomenal! What an asset to our party. Not only was the service to our guests great but the set up and extra time cleaning up was so appreciated. It allowed us the time to spend with our guests and not have to worry about serving them. Highly recommended! We hire liquid motion to help with a wedding for one of our clients, and from beginning to end Brian was very responsive, any questions I had he would respond them right away. He made sure we met all the requirements for the city venue. The day of the event he was on time to set up, clean pressed uniform and great attitude, all guest were happy and he took care of all the cleaning for the bar area at the end of the night. I recommend liquid motion to anybody that wants to have a great bartender experience. Great addition to my wedding! Liquid motion bartended at my wedding and they did a great job! Meeting beforehand made me feel at ease even before the event and I could tell Brian the owner was willing to do anything he could to help me in planning and I know he took extra Time and effort to do so- they served the alcohol we purchased privately so it was sooo nice that they were flexible! The day of the event they were on time and proficient at their job! They even did other tasks weren't required but helped us out a lot. Thanks again for going above And beyond! I worked with Brian in advance of our wedding and he got us hooked up with all of the important information and tools necessary to be properly stocked and ready to roll for our wedding cocktail hour and reception. He was very easy to work with and communicative throughout the process. The day of the event he did a fantastic job and I heard from a number of people who made note of how friendly he was and how good the service was as well. Our day of coordinator told us after the fact that he stuck around to help them load out after the event in the rain, despite being long-since off the clock for us. He was a huge help toward making our wedding stress free and enjoyable and I'd gladly work with Brian and LiquidMotion again if the opportunity were to arise. Brian and Chad were a delight to work with, from start to finish. Very responsive to all my questions, great attention to detail throughout the process... if they didn't have an answer to my questions right away, they said so, and let me know as soon as they did. As for the event, they were on time, tidy, extremely professional, and great with our guests. I would not hesitate to hire them again, and recommend them without reservation. Seriously, these guys are great. From my first encounter with Liquidmotion, via GigSalad, they were 100% professional. My inquiry was responded to promptly, they run a pretty seamless operation, and after making inquiries for bartending services with other companies I also realized they offered competitive prices and services. The person with whom I had primary contact, Brian, was friendly and answered my plethora of questions completely and immediately. Unfortunately, the party for which I requested bartending services had to be canceled. However, when I informed them of this the company immediately followed up with me and quickly refunded my deposit. Even though I did not get the privilege of using their services I HIGHLY recommend Liquidmotion. Any company that has this kind of work ethic is totally worth working with. We had Santiago come for my wife's 50th birthday and Santiago did a great job managing the bar and entertaining at the same time. Flair bartending was different for this group of friends and added some flair to the entire party! Brian came early to set up and was very professional, respectful and helpful getting everything set up for our event. The trick bartenders were a fun twist to our party and everyone had a great time! Would use them again. From start to finish, Paul and his team had answers to every question and were very helpful with preparing for our event--they knew exactly how to handle the space and crowd, and were SO friendly! 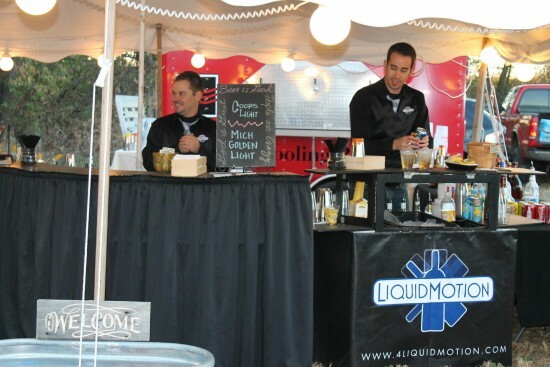 The next time we are doing an event in the area, you can be sure we are calling Liquid Motion again! Absolutely recommend! AMAZING, Definitely going to use them again! Paul was very professional and arrived on-time with all of his supplies. He was outgoing and friendly with the group and got them engaged. He had some great ideas for future parties We received great feedback from clients and co-workers about Paul. I would highly recommend using this company. Brian was amazing to work with - from planning, prep the night of, and during my party. Communication leading up to the event was always prompt and helpful. Brian was punctual the night of and received raving reviews from all of our attendees. I look forward to welcoming LiquidMotion back into my home for our next party! We had a last minute cooperate event and needed a bartender to help serve drinks. After coming across Liquidmotion I found the perfect match! The initial communication was great, they helped me plan for the number of drinks, what to order and the price is hard to beat for all that they do! The bartender (Chris), showed up on time and setup his bar and before we knew it he was slinging drinks! He was really personable and was the perfect bartender for the event. I wouldn't hesitate to use them again for upcoming events, I would really love to have them for a flair show in the future! We'll be using these guys again! Rick & Justin did a great job at our event. They were punctual, hard working, friendly, and very helpful! We will definitely be booking with Liquidmotion again. Thanks again! Liquid Motion = The Bomb. We met with the owner, Brian, about a month or so before the party and he was so incredibly helpful in terms of explaining what we needed, things to consider, and ideas outside of the realm of bartending. He has a lot of experience doing parties and events so he knows what works and what does not work. Anyway, Brian did a great job of communicating with us up the date of the party to make sure everything would go as smoothly as possible, so I felt confident that our spirits and booze was covered. Brian and his team arrived when they said they would and set up their station. When the party finally started, they did awesome. They provided a great show - think Tom Cruise in the movie, Cocktail. They were super personable with my invitees and made sure everyone was taken care of. After a long night, they packed up and even helped my wife and I pack up some of the decorations. They stayed until we had everything handled and we all left for the night. Overall, Liquid Motion was perfect. They went above and beyond the call of duty to make sure that the night was awesome. I would confidently refer these guys to anyone in need of a bartending services at any type of party, event, etc. Fun to watch and drink! The expert mixologist from Liquidmotion was a great addition to our holiday party! He personalized the drink menu, and provided lively enteratinment while serving delicious drinks. This event was such a success. Our students loved it and the guys were so easy to work with! Brian was so organized leading up to the event it made the day run very smoothly! He gave us a wide variety of Holiday "Mocktails" to offer our students. We will cetainly bring Liquidmotion back for other events in the future. I needed a last minute bartender for our wedding, and found Liquidmotion on the Internet. After personally talking to Brian, he was able to organize having a bartender work out event and ease my nerves quickly. Ann was our bartender and she was awesome! Showed up early, super friendly, and was great at interacting with our guests. The whole process was really easy, and everyone was great to talk to and work with. Definitely recommend them for any event! IN ABSOLUTE AWE OF ONE'S SKILLS!! Liquidmotion hosted a corporate event with clients and media in attendance, complete with special recipes developed using the client's products. Almost all of the attendees stopped to take photos and videos and chat with the flair bartender to learn more about the recipes -- and all the cool tricks he was doing. Working with Brian and his staff was a wonderful experience. Organizing all the details was incredibly easy and smooth. The entire staff was so courteous, professional and nice, it made the whole event that much more enjoyable. I would definitely recommend LiquidMotion for any type of bartending service. That's so much! A Great Choice for Your Event! We booked Paul Trzcianko from LiquidMotion for a trade show in Las Vegas and could not have been more thrilled with his performance. His flair bartending and skills really drove people to our booth. He was very professional, friendly, and a pleasure to work with. We would certainly use him again and recommend him to anyone. Thanks again, Paul! LiquidMotion did it again! They were a huge hit with our students - they served over 850 mocktails in 4 hours; quite impressive! We greatly appreciate working with such a professional and dedicated company. We will definitely have you back! Very professional. Very good. I would reccomend Brian and his team. They bartended and provided sound for my Grooms dinner on 9/19/13 and were great. Liquidmotion provided the bar service for our outdoor wedding recently and they were wonderful! Brian was so nice to work with prior to the event and was so helpful in helping decide on numbers to plan for our cocktail hour & reception. Brian and Ann helped with all of the set up & tear down of the bar the day of and were friendly and interactive with our guests. We highly recommend Liquidmotion, thank you for your excellent service!! Great service!! Brian did an awesome job!! Brian did a fantastic job for our wedding! Several guests commented on how nice he was and how cool it was we got a good bartender! I would hire him in a heartbeat for any future event! Insurance: General Liability, Liquor Liability, and Excess Liability Coverage. Liquidmotion entertains in a combination of ways. Through “working flair,” the bartenders perform tricks while they bartend and make drinks. Expertise and experience allow our bartenders to give excellent and efficient service while incorporating a wide variety of eye-catching and show-stopping drink making techniques that are sure to enhance your event. With “exhibition flair” our bartenders take center stage. By using complex tricks and choreographed routines, a flair bartender can captivate any size crowd. Our three to six minute routines can be used alone, purely to entertain the audience, or incorporated at timed intervals in addition to the functional bartending of your event. Imagine the scene when the bartender breaks into a bottle flipping frenzy to make the drink for your guest of honor! Brian Zachau and Paul Trczianko are bartenders, consultants, and corporate trainers who have also been recognized for their competitive successes and achievements as bartenders. 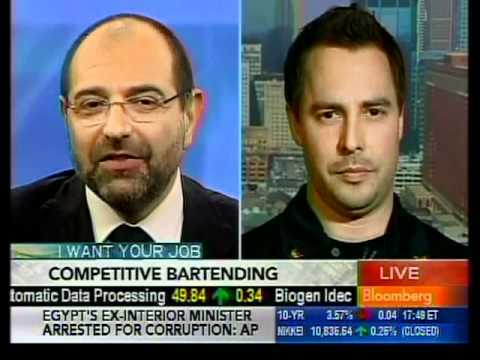 In 2006, Brian and Paul co-founded the beverage consulting company Liquidmotion, a now sought after bartender staffing, training, and performing expertise company. The Liquidmotion team, which currently employs a staff of six talented flairtenders, has performed for a wide range of clients including: Hollywood premiere parties, billionaire’s birthday bashes, corporate events, and even barnyard weddings. Their corporate clients have included: General Mills, Moen, Young Living, US Foodservice, Derse, Mohegan Sun, Activision, and Diesel USA. Brian Zachau is the only American to win the internationally respected TGI Friday’s World Bartender Championship in the past 15 years. On his path to the title, he “raised the bar” by setting company records for most World Bartender Finals appearances (7 consecutive), most US Championship titles (6 consecutive), and first place finishes in the speed and accuracy round, twice. Brian has been featured in the media for his flair and bartending expertise and is a regular contributor to drink demonstrating segments on both a local and national platform. He has been seen nationally on SPIKE TV, Food Network, Bloomberg, TMZ, The Daily Buzz, and the Mancow show. Locally he has been seen on Twin Cities Live, Franchise Times, MetroMix, TV Twelve, Twin Cities Live, Dallas Morning News, and many other shows.